This sounds delicious! I’m beginning to realise there’s a whole world of new cakes which will open up when my CT leaves home! Are you sure it’s not the maca powder which made the cake ‘sprightly’? I’ve just looked up what it is and one reference was for increased libido! LOL! Is your CT going to be leaving home soon? No idea what mesquite or maca powder are, will have to look them up. as janice said! BUT, just wanted to add, trust you to find a fruit cake with CHOCOLATE!!! Say Whaaat? Vinegar cake sounds awesome – and could be a great standby for when my vegetarian-vegan-swinging sister-in-las stops by. I never know which side of the meat free knife she’s on, so this is good for being better safe than sorry! Thanks Juliet. Beware of vegan, it may have no eggs, but it does have butter, so you’d need to substitute with oil – don’t see why that wouldn’t work though. Manu, give it a try – it’s worth it just for the whoosh! mmm… I love a cake that is more pudding than cake… i’ve just made one in fact but never made anything like this with vinegar… sounds very ‘make-do-and-mend’ like the kind of thing done in the war… looks delicious! I’ve seen recipes for vinegar cakes in a number of old recipe books and I’ve often wondered what they’d be like but never got around to making one. It looks really good – and there’s something very pleasing about a traditional fruit cake. Phil, I’d love to have a browse around your recipe books, sounds as though you have some real gems there. I’d say it would be hard to tell there were no eggs in the cake – all very interesting. I’ve wanted to make a vinegar cake but the name has always put me off. Seeing how lovely yours looks I will have to reconsider! Oh don’t let the name deter you CC, it’s a fascinating process and I really couldn’t taste the vinegar in this one. What an intriguing recipe! Mesquite powder-where did you find this?? Ahh, I stock up with all things weird and wonderful whenever I visit Totnes – Greenlife, it’s a great store if ever you’re passing that way. I think they have an online service too. You’re welcome Corrie, presumably, this would work with most cakes. It was certainly fun watching the fizzing process. Hi Deb. I’ve made a vegan chocolate cake before using balsamic vinegar, which was good. I’ve got a few vegan recipes on my site if you look at the vegan label down the side or do a search in the search box. Nonnettes are another eggless cake, which are one of my favourites at the moment, though have no idea how it would work with oil. this fruit cake would be fine with oil I’d have thought. When I read the title I was slightly dubious about this cake, but it’s only a small amount of vinegar and I think slightly undersells what looks like an absolutely gorgeous fruit cake. Definitely more exciting than vanilla! Hehe, it’s a great title – nothing more likely to put you off, well perhaps a few things, but you know what I mean 😉 But I liked the title, it makes you do a double take. A very clever choice for your “v” entry and one I would jump at the chance to try. I adore vinegar and all sour sharp tastes. I know it would not be an obvious kick in this recipe but I am sure it adds another dimension and one which is novel to me! Thanks Laura. I’ve made a vegan chocolate cake using balsamic vinegar which turned out well, but it didn’t use the same method as this. Yes, I’m happy to go with the extra dimension – vinegar is a great ingredient to lots of things. Thanks Gloria – it’s actually a surprisingly good fruit cake. That looks great – I too had that one bookmarked for this challenge but ran out of time, and also had an excess of eggs – not a great cake to be baking when too many eggs are the problem!!! Good to know it’s a nice light fruitcake – I’ll try and remember to bake it next time I need cake and eggs are not forthcoming. It’s always fun to see chemistry in action in baking isn’t it – I keep meaning to make honeycomb for this reason alone! Oh C, you mean it wasn’t just me 😉 I had far more success with this fizzing up than I ever do with honeycomb, it was fun to watch. I agree with the res never heard of vinegar cake but glad to see it has not eggs in it as I have been looking for eggless cakes and not found any yet – perfect timing! 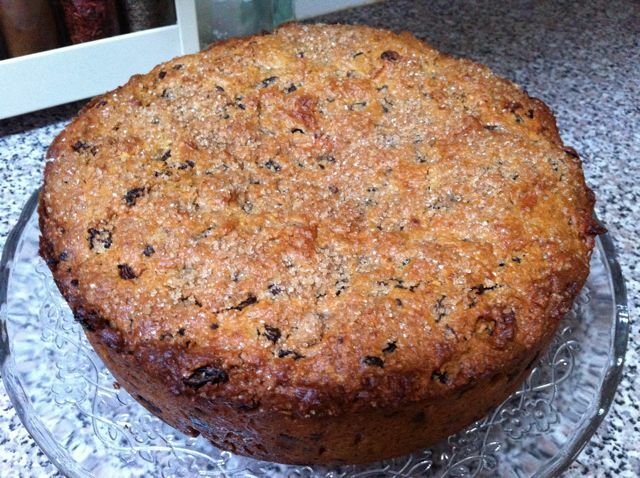 Ahh cakeboule, this is a good tasty fruit cake, but do check out the nonnettes I’ve made. They are also eggless and are my favourite cake at the moment – I’ve done two different ones and both were delicious. I’ve also done a few vegan cakes which turned out well. If you’re interested, you’ll find them under the vegan tab down the side. Hi Johanna, yes it has a similar effect to yogurt being used with bicarb – it’s the alkali reacting with the acid. V is for very clever and interesting! well done on this. Cookign really is like chemistry! Wow! I am going to give this a try… though I may have trouble sourcing mesquite. This looks fascinating – I can’t wait to have a traditional English afternoon tea party. This would be a great addition. Did you ever try it Wendy? The mesquite is my own addition and can quite happily be substituted with flour. MMM love fruitcakes! Will try this one when my friend comes to stay as she has an egg allergy. Thanks Lucy, it’s always handy to have something up one’s sleeve for such occasions.